Note: this is an add-on. You must have at least PrivateContent v6 and WooCommerce v2.5 to use it. PrivateContent is known to be a free membership plugin, but what if you want to make money with your website? Premium Plans add-on satisfies this need, turning the original plugin into a true platform to monetize your contents and set time limits. It is based on the most popular wordpress e-commerce system: wooCommerce! Using its powerful, stable and extensibile systems to create subscription plans and manage payments, offering the most complete e-commerce experience you can have today. As per LCweb’s philosophy, you have complete fredom on setup: plans can be free or also without time limit. You can even set a trial period, applied to new registered users. Premium plans could be also a great way to allow only trusted users into your list: in fact is possible to automatically enable pending users after successful payment. But what does it implies for existing users? Nothing! 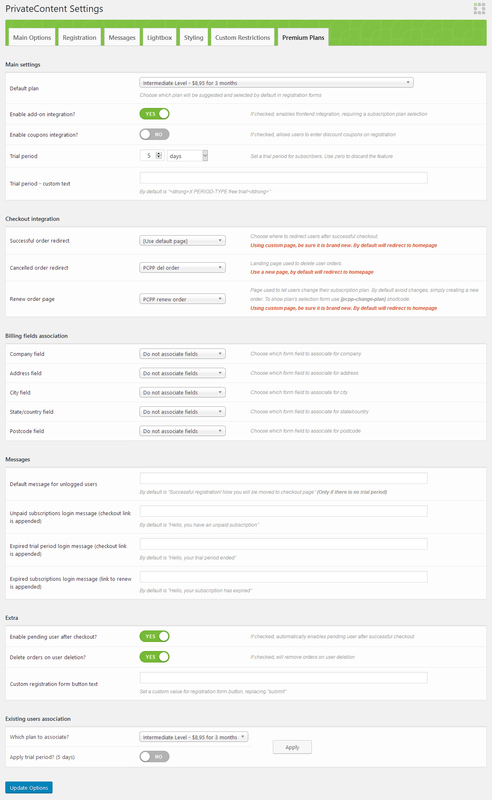 Existing users are detached from Premium Plans systems and by default are still able to login. Obviously is possible to bulk assign a plan to them or just do this individually. Whole add-on systems are totally automated: from registration to subscription activation and expiration check. 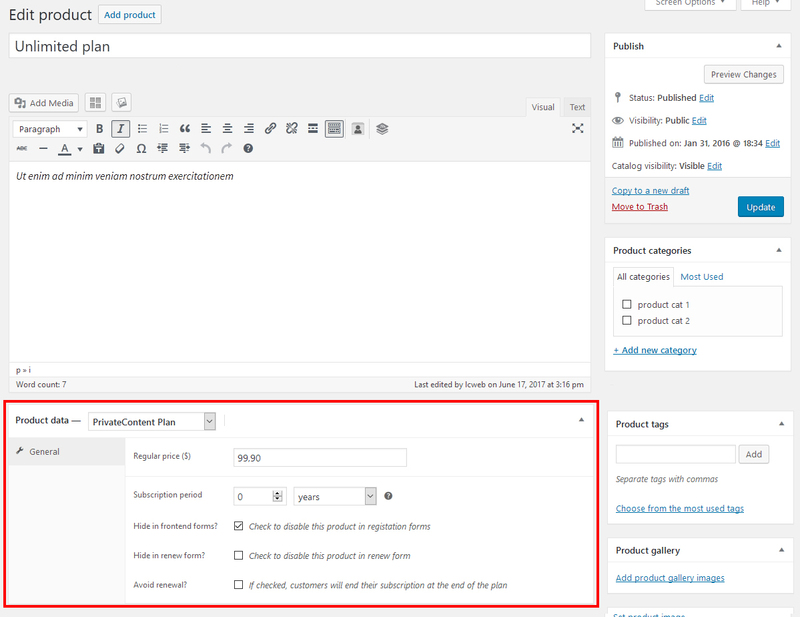 You’ll be able to control orders and payments status through WooCommerce, as well as edit user’s plan, status and expiration date in “edit user” page. 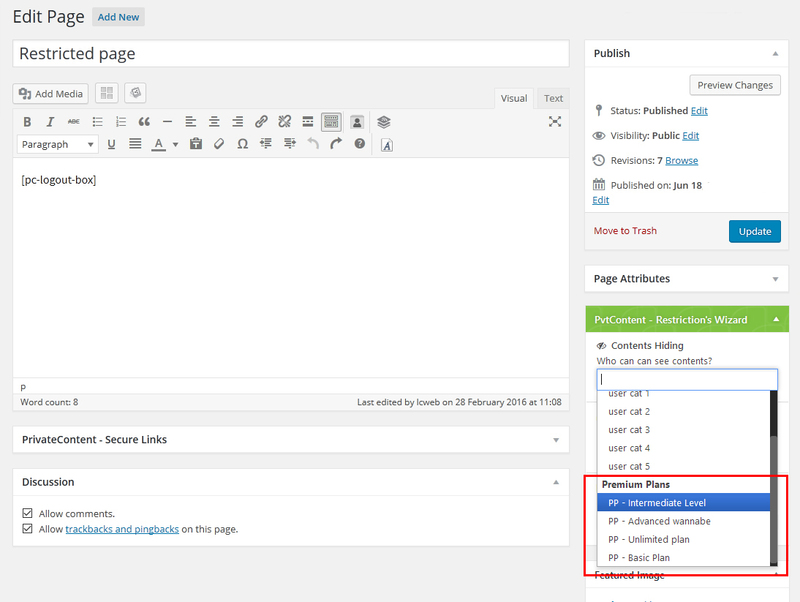 One of PrivateContent core functions is the power to control website elements visibility. 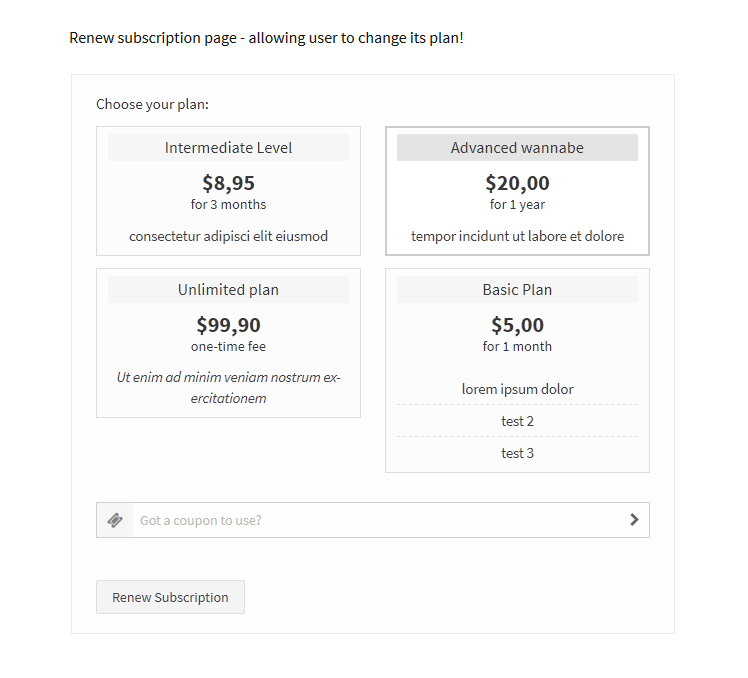 Premium plans add-on extends this system, adding the ability to restrict elements basing also on subscription plans. This is an essential tool for anyone wanting to create a multilevel premium content website. What is the most used system to increase sales across the world? Discount coupons! Plans can be discounted using WooCommerce coupons. 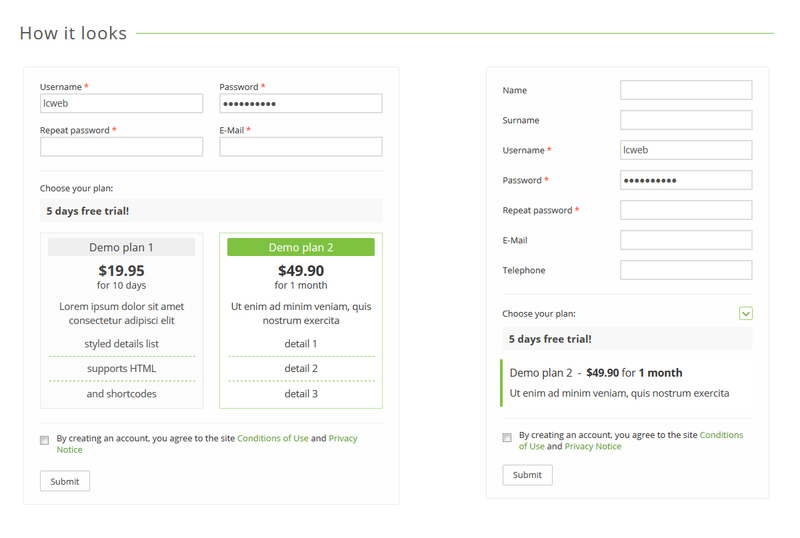 As you can see in the demo, there’s a field where users can insert their coupons. This is obviously added also in subscription renewal forms. Renewal system is totally automated: once expired, login form’s message will ask user to renew and pay the new order, without any delay. Is also possible to let users change their plans on renewal. Maximum flexibility with ease! Owning also Mail Actions add-on you can take advantage of automatic reminders for expired subscriptions. 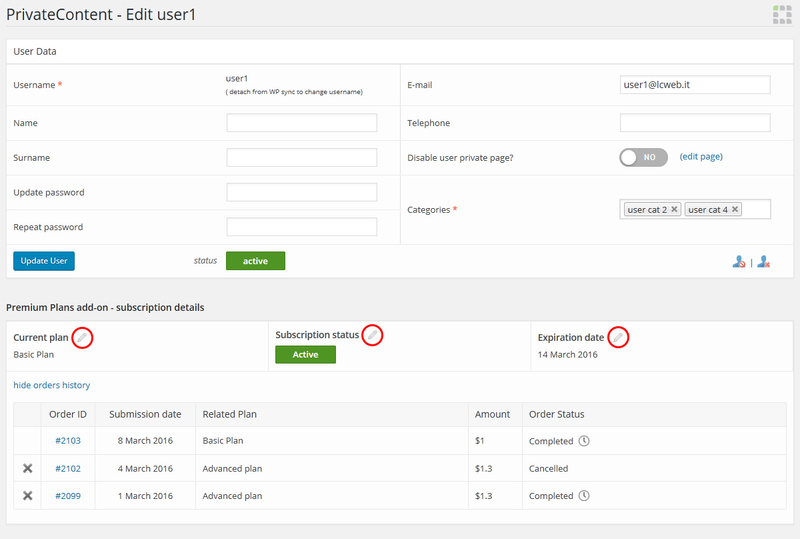 Setting up a cronjob, your website will automatically inform users when their subscriptions just expired, pushing them to the renewal page! 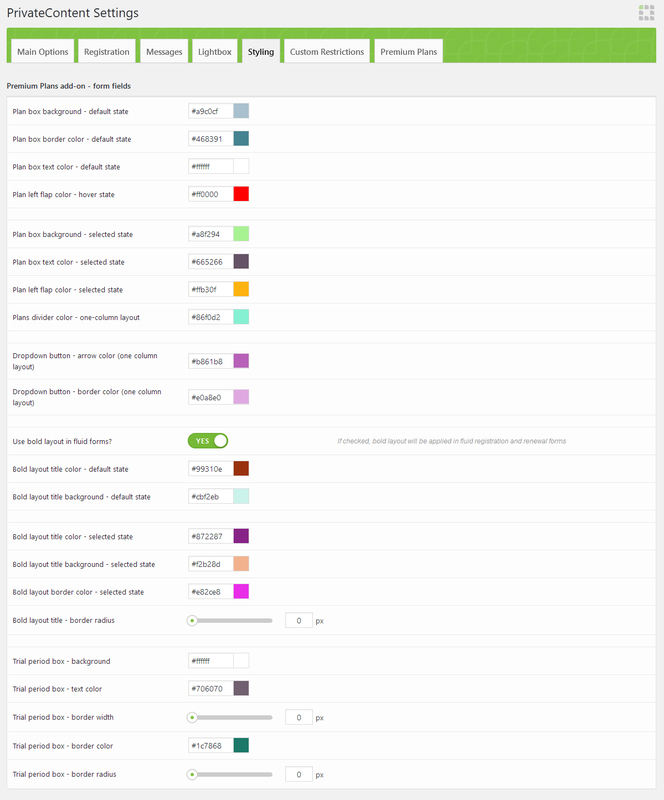 Complete integration also on design side, adapting to PrivateContent styles and having plenty of customization fields to manage colors. Three layouts: one for one-column forms and two for fluid ones.